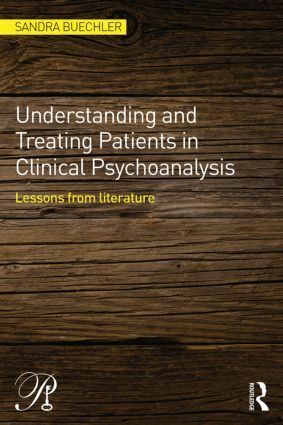 Understanding and Treating Patients in Clinical Psychoanalysis: Lessons from Literature describes the problematic ways people learn to cope with life’s fundamental challenges, such as maintaining self-esteem, bearing loss, and growing old. People tend to deal with the challenges of being human in characteristic, repetitive ways. Descriptions of these patterns in diagnostic terms can be at best dry, and at worst confusing, especially for those starting training in any of the clinical disciplines. To try to appeal to a wider audience, this book illustrates each coping pattern using vivid, compelling fiction whose characters express their dilemmas in easily accessible, evocative language. Sandra Buechler uses these examples to show some of the ways we complicate our lives and, through reimagining different scenarios for these characters, she illustrates how clients can achieve greater emotional health and live their lives more productively. Drawing on the work of Dostoevsky, Tolstoy, Munro, Mann, James, O’Connor, Chopin, McCullers, Carver, and the many other authors represented here, Buechler shows how their keen observational short fiction portrays self-hurtful styles of living. Sheexplores how human beings cope using schizoid, paranoid, grandiose, hysteric, obsessive, and other defensive styles. Each is costly, in many senses, and each limits the possibility for happiness and fulfillment. Understanding and Treating Patients in Clinical Psychoanalysis offers insights into what living with and working with problematic behaviors really means through a series of examples of the major personality disorders as portrayed in literature. Through these fictitious examples, clinicians and trainees, and undergraduate and graduate students can gain a greater understanding of how someone becomes paranoid, schizoid, narcissistic, obsessive, or depressive, and how that affects them, and those around them, including the mental health professionals who work with them. Introduction: Characters in Fiction as Templates for Clinical Assessment and Treatment, 1. Schizoid Relating, 2. Paranoid Processing, 3. Humiliated Suffering, 4. Grandiose Posturing, 5. Hysterical Bargaining, 6. Obsessive, Controlling, 7. Anguished Grieving, 8. Depressive Self-Harming, 9. Generative Aging. Sandra Buechler is a training and supervising analyst at the William Alanson White Institute. She is also a supervisor at Columbia Presbyterian Hospital’s internship and postdoctoral programs, and a supervisor at the Institute for Contemporary Psychotherapy. Her publications include Clinical Values: Emotions that Guide Psychoanalytic Treatment (Routledge, 2004), Making a Difference in Patients’ Lives: Emotional Experience in the Therapeutic Setting (Routledge, 2008), and Still Practicing: The Heartaches and Joys of a Clinical Career (Routledge, 2012). When music is played in a new key, the melody does not change, but the notes that make up the composition do: change in the context of continuity, continuity that perseveres through change. Psychoanalysis in a New Key publishes books that share the aims psychoanalysts have always had, but that approach them differently. The books in the series are not expected to advance any particular theoretical agenda, although to this date most have been written by analysts from the Interpersonal and Relational orientations. The most important contribution of a psychoanalytic book is the communication of something that nudges the reader’s grasp of clinical theory and practice in an unexpected direction. Psychoanalysis in a New Key creates a deliberate focus on innovative and unsettling clinical thinking. Because that kind of thinking is encouraged by exploration of the sometimes surprising contributions to psychoanalysis of ideas and findings from other fields, Psychoanalysis in a New Key particularly encourages interdisciplinary studies. Books in the series have married psychoanalysis with dissociation, trauma theory, sociology, and criminology. The series is open to the consideration of studies examining the relationship between psychoanalysis and any other field – for instance, biology, literary and art criticism, philosophy, systems theory, anthropology, and political theory. But innovation also takes place within the boundaries of psychoanalysis, and Psychoanalysis in a New Key therefore also presents work that reformulates thought and practice without leaving the precincts of the field. Books in the series focus, for example, on the significance of personal values in psychoanalytic practice, on the complex interrelationship between the analyst’s clinical work and personal life, on the consequences for the clinical situation when patient and analyst are from different cultures, and on the need for psychoanalysts to accept the degree to which they knowingly satisfy their own wishes during treatment hours, often to the patient’s detriment.